There are numerous sources of information about the 2012 Olympic and Paralympic Games. 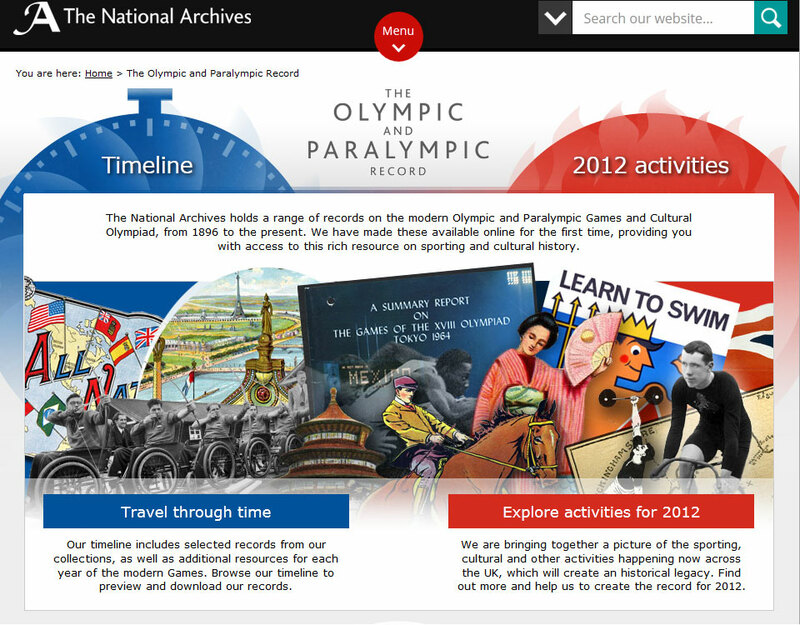 The National Archives has records from the London Organising Committee of the Olympic and Paralympic Games (LOCOG) as well as a dedicated website The Olympic and Paralympic Record. The website has two sections: the first is a timeline highlighting records from Olympic and Paralympic Summer games from 1896 to 2012, and the second is a record of sporting and cultural activities that took place across the UK before, during and after the 2012 Games. Records about sport in general are available in specialist archives as well as at The National Archives and local archives. See the section on general sports records at The National Archives for more information. There are also directories which help to locate records about sport. These are listed below. Search Discovery to find records from The National Archives and over 2,500 other archives across the UK, as well as some abroad. For detailed advice on searching Discovery and understanding your results see our Discovery help pages. If you want to search for records at The National Archives only, choose the relevant option under the search box. Try searching for a particular sport, event or organisation. Searching for famous sports personalities by name is a bit hit and miss – if you don’t find anything you could try searching for events or organisations they were involved with instead. Unless you have restricted your search to The National Archives only, your search results are likely to list records held at more than one archive. If you want to find out how to see a specific record, you will need to contact the relevant archive directly. If you get too many results, you can use the filters on the left to narrow them down by the dates the records cover or the archive they are held by. Alternatively, you can use the Advanced search option and include more about what you want to find before you search. Searching Discovery won’t find everything. Records of sports organisations and individuals can be held in local record offices, university collections and special repositories. Not all of these places have their collections listed in Discovery, and some have only part of their holdings listed. Whilst Discovery could be the best way to start your research, you should also think about looking for archives based on their locality or the theme of their collection. You can use Find an archive to search for an archive in this way. For example, search for ‘Manchester’ or for ‘football’ to see what archives cover the Manchester area or hold football-related records. For more advice on using Find an Archive, see Discovery help. You will also find libraries are a great resource as there are plenty of published works on sport and related topics. Search The National Archives’ library catalogue for publications you can see onsite at Kew. Numerous organisations recorded their activities and events before, during and after the 2012 Olympic and Paralympic Games, creating an unprecedented distributed archive collection. We have gathered together information about the records on a dedicated website, The Olympic and Paralympic Record. The London Organising Committee of the Olympic and Paralympic Games (LOCOG) was established in July 2005 shortly after the Olympic bid was won by the UK Government London Olympic Bid Team. LOCOG was responsible for organising, publicising and staging the London 2012 Games. Its records include material ranging from the bid process and the planning and delivery of the Games, through to the organisation’s own dissolution. The National Archives reached a landmark agreement with LOCOG, the British Olympic Association (BOA), and the International Olympic Committee (IOC) to ensure access to the records of London 2012. The records have been deposited at The National Archives to ensure their long-term preservation and future public accessibility. The majority of records from LOCOG are in digital form and are gradually being transferred into our digital archive. As this process continues, Discovery will be updated to include references to these records. London 2012 is considered the first digital Olympics. With dedicated websites, blogs and Twitter feeds there was public engagement and involvement as never before. 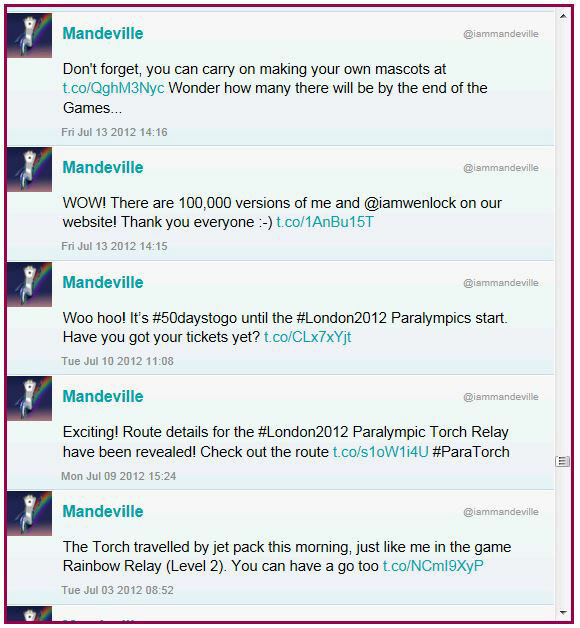 The London 2012 Olympic and Paralympic Games and government organisations created tweets on Twitter and videos on You Tube. 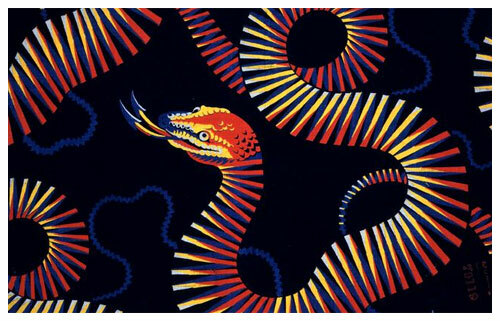 These have been preserved on the UK government web archive as part of the public record. Use Discovery, our catalogue, to search for records. If you only want to find records held at The National Archives, select that option underneath the search box. Many archives regularly take in new records to add to their collections – this process is known as accessioning. Every year, The National Archives collects information about new accessions from over 250 archives across Britain and Ireland. This survey is known as ‘Accessions to Repositories’. Find out where records relating to sport have been added to archive collections in any year from 1995 by clicking on the relevant year and then picking ‘sport’ from the list of topics. Accessions relating to the Olympics can be found from 2010 onwards by looking in the topic ‘sport’ and/or ‘London’ and from 2012 the topic ‘2012 Olympics and Paralympics’ is included. Some organisations hold records relating to national or even international sport disciplines. Based at the headquarters of the International Olympic Committee in Switzerland. Holds archives relating to the history of both the Summer and Winter Games since 1894, including microfilm and text documents. Holds unique collections of football artefacts and archives, including the FIFA collection and the Harry Langton archive. Holds records of the Marylebone Cricket Club, from 1714 onwards, as well as archives of individual cricketers, including Pelham Francis Warner. Holds the archive of the Rugby Football League, which contains records of individual players and clubs in Cumbria, Lancashire and Yorkshire with records for all British professional clubs since 1896. 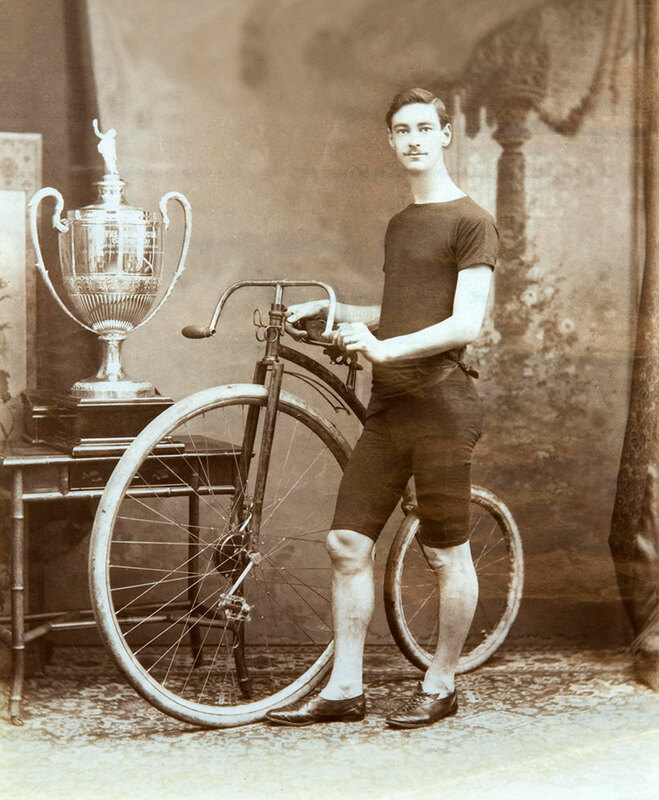 Holds the National Cycling Archive, which includes records deposited or donated by cycling bodies and individuals. Holds the records of Commonwealth Games Scotland. 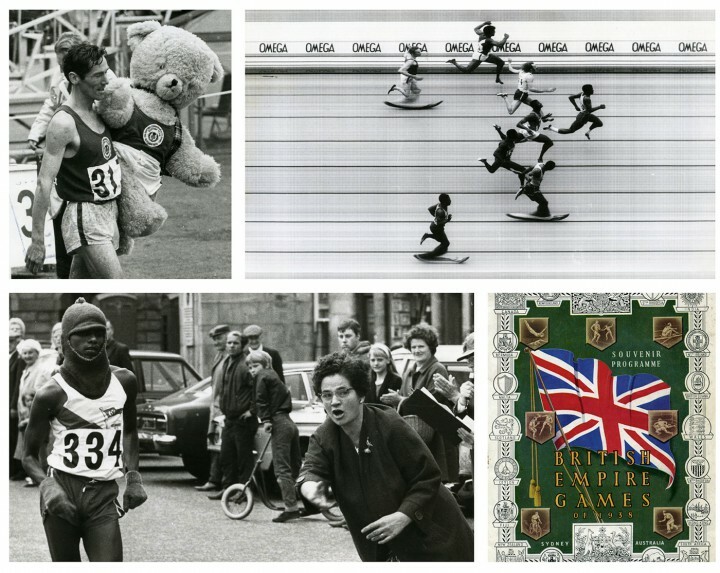 The archive includes papers relating to the organisation of the 1970 and 1986 Edinburgh Commonwealth Games. You can find more records relating to the Commonwealth Games in Discovery. The BFI Player allows you to browse a range of films relating to sport disciplines which can be viewed online. To discover more film footage relating to sport, search Find an archive using the keyword ‘film’. Some local archives with specialist collections have put together their own guidance to help locate records relating to sport. Guide to the records of Sheffield Wednesday Football Club at Sheffield Archives & Local Studies. Guide to records relating to local sports clubs and associations at Gwent Archives. Guide to locating archives of national, regional, county and district Sports Organisations at West Yorkshire Archive Service. Information guide relating to sports collections shared by Warwickshire archives, museums and local history groups and communities. Guide detailing mostly sport club archives for east-central Scotland, but also sporting activities from the 15th to 20th centuries within private papers, at the National Library of Scotland. 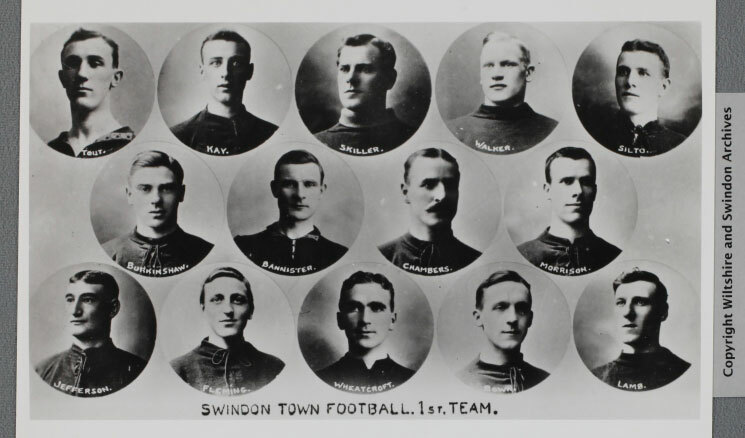 Resource guide for sport-related collections held at Wiltshire and Swindon History Centre. Some organisations have created directories of collections, websites and other information about sport archives. Directory of sport-related archive and museum collections. London 2012 Olympic and Paralympic Games collection. Collection of archived websites of official bodies, local councils, forums and business websites which documents London 2012. Hosted by the UK Web Archive, British Library. Online collection of sound recordings, maintained by the British Library Sound Archive, which documents the activities of sportsmen and women of Britain in the twentieth century, including interviews with sports players, coaches and enthusiasts. ‘Inspired by London 2012’ project which records the impact of the London 2012 Olympic and Paralympic Games. Online memories collected by a charity which uses memories of sport as a form of reminiscence activity for people suffering from dementia, depression and loneliness. Take a look at our array of podcasts relating to sport.